As you know, our website is full of useful resources that can be utilized in a variety of ways and contexts. Here are some of our favorite lesson plans and creative strategies that have been employed by educators to help kids get more out of A Book And A Hug! It is hard to write individual lesson plans for this as many of us have different instructional period allocations in addition to frequency of classes. My intended audiences are third through fifth graders. These are the only grades with whom I have attempted these lessons because of my own curriculum goals for kindergarten through second grade and their typing and reading abilities. I present these lessons in a continuous stream to allow for individuals to adjust the activities to their own time and curriculum limitations. 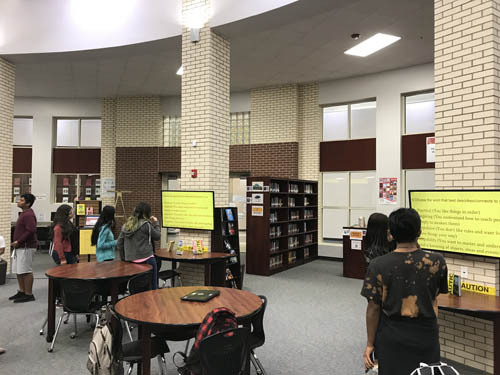 Students will be able to use the book recommendation website (A Book and a Hug) in conjunction with their library’s catalog (whether online or card, school or public) to help themselves, independent of a librarian, library aide, or teacher, choose books according to their interests whether personal or academic. I introduce the site as the creation of a public librarian, Barb Langridge, who has observed four different reading personalities that she has named The Champion, The Team Player, The Jokester, and The Investigator. Barb has created a “reader personality quiz” or assessment for individual readers to use in helping choose books meeting their reading personality(ies). Students take the online quiz to ascertain their reading personality. I encourage them to choose only one answer, but if unable to make a choice and it’s holding them back from proceeding to the next question, that they may mark a second choice also. When all have completed the quiz, we survey the results to see how many of each type personality is in the class. We realize that some may actually fall into two categories and in rare cases three. We also many times discover that Jokester is the category into which most students fall. I have them read the description to see it doesn’t mean, according to Barb, that they are necessarily a class of pranksters. I then have students read the description(s) that match their results. I ask them if they think the descriptions do come close to what they think of themselves. If it is a third grade class, this may be as far as we get in the initial lesson. I do stress that we will return to this lesson in our next class but that they are free to explore the site on their own until we meet again. 2. What is your reader personality? We see the search box on the homepage of Destiny and discuss the types of search terms one could enter: keyword, author, title, subject, series. We compare that to the search set up for A Book and a Hug. What is the same, different? What keywords can be used and what does that mean for their search results? How is a keyword search different from a subject search? Lead students through the menu bar/navigation bar options, both at the top and sides of the pages. Review how to return to the homepage and the use of the back arrow to retrace their steps to wanted pages. While looking at the different pages, have students tell what information and how they might use that information found on each page. Leave time (Five to seven minutes is my recommendation.) for students do their own playing and exploring of pages and links. In this lesson, I specifically focus on search limiters such as reading level, genre, reader personality types. Return to the school’s OPAC to determine what options for limiting their searches are there. In Destiny, one can search of Award Winners, which I especially like. I created a way to turn the Find Your Reader Personality Type (Advanced) quiz into an activity that gets kids up and moving! There are 7 televisions in the library. Each question is posted simultaneously on all the televisions at the same. Students carry a post-it-note with them to take keep a tally on their answe4rs, and to figure out what kind of reader they are at the end of the assessment. 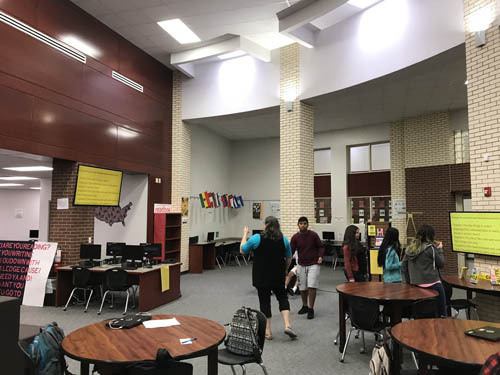 There are four stations around the library (A, B, C, and D). Students walk to the station that best matches their choices. For example, if they answer “D” to question #5, they move to the D location before moving on to question #6. Once students have completed the assessment, they move to another room in the library where I have a selection of choice books that fit well with each of the four reader types. This allows students to begin investigating specific titles in the genres/classification that they seemed to best align with in the assessment. This also encourages students to participate fully in the survey instead rather than seeing a book they like at a certain station and simply “opting out” of the rest of the survey (“I already know what books I like”). Below are some pictures so you can see my implementation in action. I hope this inspires you to get your kids more invested in the Find Your Reader Type quiz, and to start finding more books they will love!